Alliance Media was named an East Africa Superbrand for the seventh year in a row at an awards ceremony at the Serena Hotel Nairobi on Friday, 16 November. 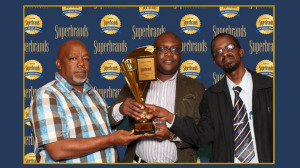 Alliance Media says it sees the recognition received by Superbrands East Africa for the past seven years as a true accolade as it underpins the fact that it fully understands the importance of creating a strong brand. The evening was dedicated to the celebration of brands in Uganda, Tanzania and Kenya. Top executives from 50 companies were in attendance including, the team from Alliance Media Kenya. "There has never been a more exciting time to identify and celebrate the region’s top brands. As Superbrands continues to identify the cream of the crop, the brands highlighted continue to provide inspiration to those aspiring to create brands with a difference," says Jawad Jaffer, the project director of Superbrands East Africa. Alliance Media’s clients use outdoor and airport advertising to build their brands across the African continent. According to Alliance Media, the Superbrands East Africa Award shows that it is a partner who knows how to grow brands. Superbrands is the world's largest independent arbiter of branding. It aims to identify and pay tribute to exceptional brands by recognising, rewarding and reinforcing leading brands from all over the world.